Friday one of my very best friends in the whole universe got married. It was beautiful and perfect and sweet and fun. 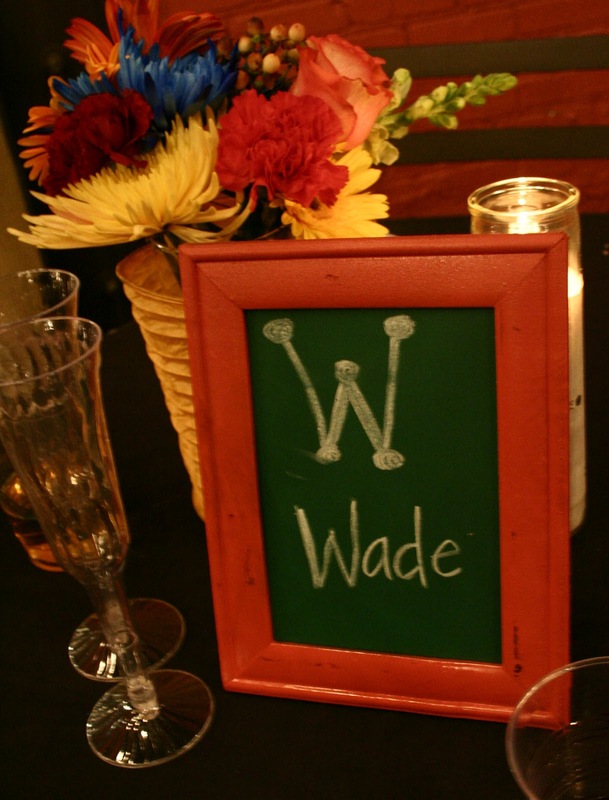 My role in the whole shebang ran the gamut – from best friend to co-officiant to party planner. The ceremony was small and sweet and simple- on a friends deck, over looking the rolling Arkansas hills at sunset. The reception was on the rooftop of a local Italian join and was lively, happy and rockin. Both were completely Jeff and Amy. Because we were working on a budget we kept things pretty simple overall. Amy wanted the reception to be colorful and bright and happy – a real celebration. She also wanted it to reflect both their styles, taste and interest. 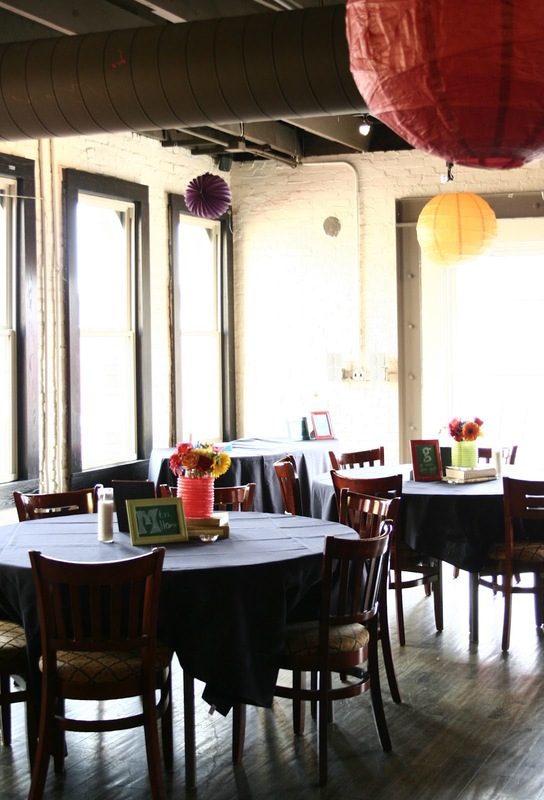 Once of the ways we did this was by creating 5×7 chalkboards to go each table. 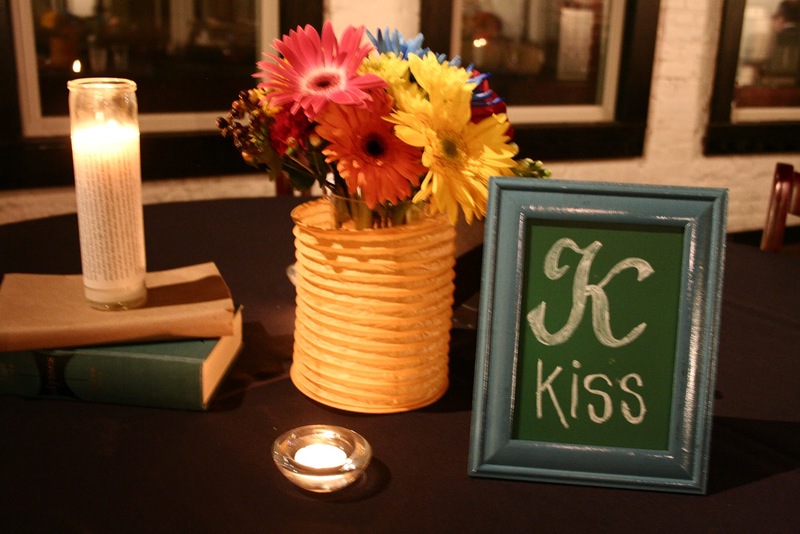 Because Amy and Jeff both work in education, the chalkboard idea seemed a natural fit. 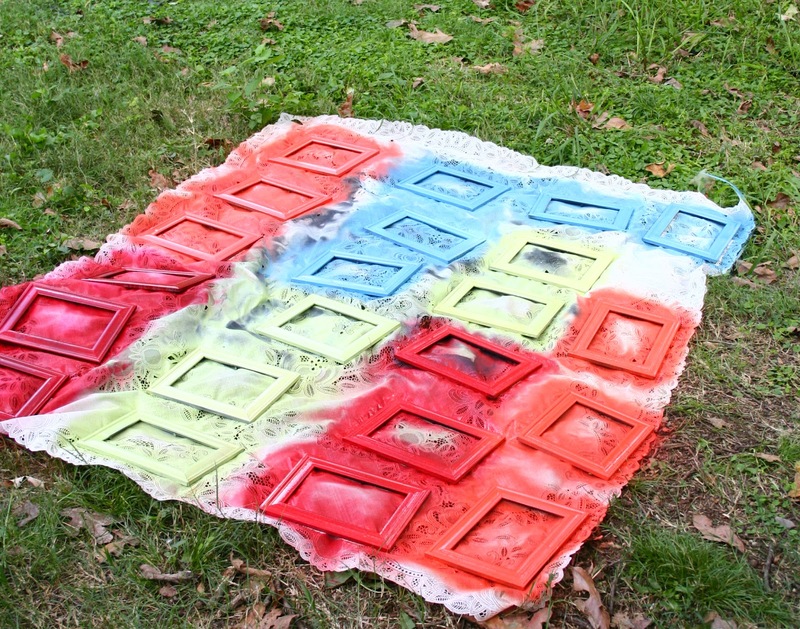 I took the glass and backs out and spray painted them in our four colors – red, green, aqua and orange. 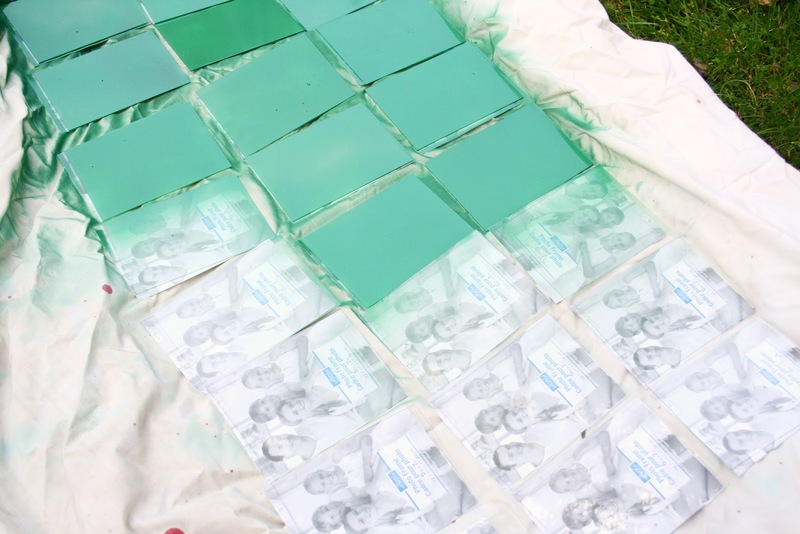 While those dried, I sprayed the glass inserts with green chalkboard paint I picked up from Hobby Lobby. I left the photo that came with the frame behind each piece of glass so that I could tell where one left off and another began. I also butted them up as close to each as possible in order to use my paint the most efficient way. After both pieces had dried we put them back together, then Summer (one of Amy’s friends and former students) who has great handwriting, wrote one letter of the Alphabet on each of the frames. We then came up with one to two words per frame to go with each letter that would mean something to the happy couple. 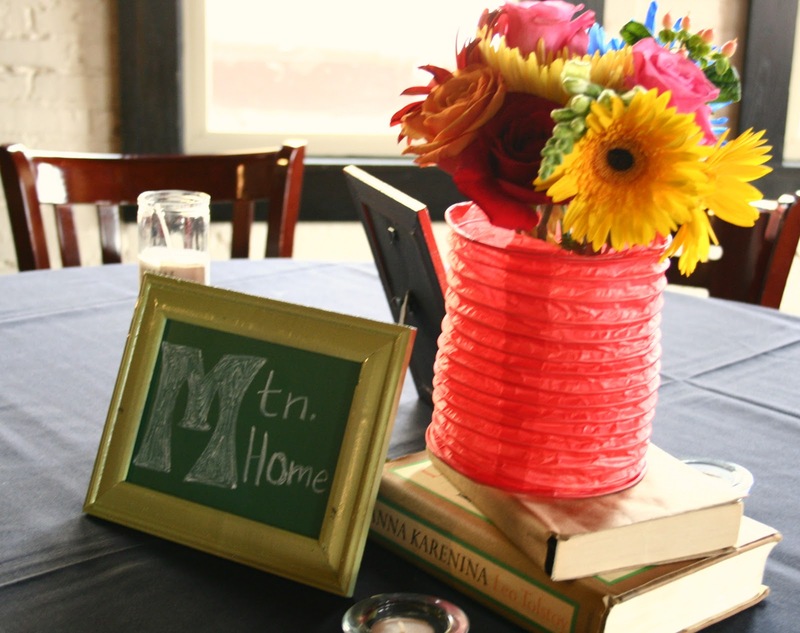 At the end of the night, several of the party goers took home either a vase of flowers, a chalkboard or a book page wrapped candle as a sort of party favor. I happen to be the one that stole a Kiss. Looking at all the frames together I thought this could be a really inexpensive and fun project for a classroom or a kids room. You could change out the alphabet words seasonally or as the kids get older. I also thought it would be fun in a kitchen with the ABC’s of cooking or baking too. I may have to find away to pull this off around here somewhere. But not yet. My spray paint finger needs time to recuperate. Love this idea! I need to borrow it for my DAD's 65th Bday!!! Thanks for the idea!!! 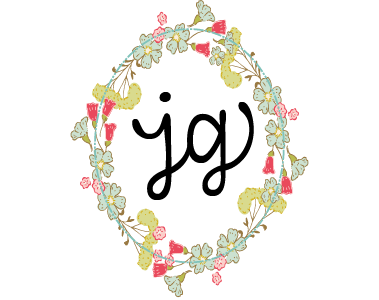 ~~~Stop by my blog for my first giveaway, it's handmade!!! !